That’s the text message I received from Aleda Nichols, KC1CCU, last night as I was relaxing in my living room after dinner. If you were to meet Aleda you’ll notice right away she’s a shy person, but her passion for amateur radio is deeper than the Mariana Trench. Just hours before I had sent out an email to the 100-plus members of my Central New Hampshire Amateur Radio Club prodding them to get involved with the National Parks on the Air (NPOTA) event that’s being sponsored by the American Radio Relay League (ARRL). The NPOTA event is helping to draw attention to the 100th anniversary of the National Park System. Aleda’s not the only operator that’s excited about NPOTA. There are hundreds, actually thousands, of licensed radio operators who have been touched by the magic of NPOTA. One of the comments was from Laura S.
Think about that for a moment. What would make a woman who’s not touched her radio for years, sit down and then flick on the switch? There are plenty of contests, special event stations transmitting week in week out and other things happening but these didn’t do it for her. What’s the mystical allure of NPOTA that’s creating the buzz among those that are participating in it? Can you think of a past radio event that’s created so many new friendships in an atmosphere of robust, but toned-down competition? Ask ten different operators and you’ll undoubtedly get ten different answers. But here’s my take as a relative newbie to the hobby. NPOTA appears to have taken the best parts of contesting, Summits on the Air (SOTA), outdoor radio both medium and low-power, social media and stirred it up in the cauldron with Logbook of the World to create a powerful elixir that’s spreading happiness from sea to shining sea. I was immediately attracted to NPOTA when it was announced. My passion for the hobby is QRP outdoor radio, but I’ve only been doing it for just under three years. What’s more my operating skills are minimal at best. The high speed and stress of normal contests are not fun for me. Some who participate in them seem to have a blood lust. I had dipped my toe in SOTA a few years back activating a hill I can see from my home, Belknap Mountain, and I liked it. It was easy to visualize setting up my radio at one of the hundred or so NPOTA sites around the USA. No doubt it would be fun and relaxing. Two seasoned operators and I decided to do a NPOTA activation back in February when Mother Nature dished up a delightful day when normally the weather could have been bitter cold here in New Hampshire. We drove to one of the three NPOTA units here in New Hampshire – Saint Gaudens – and were blessed with an intense pileup. I was hooked immediately. I decided at that point I was going to activate as many sites as I could during the rest of the year. 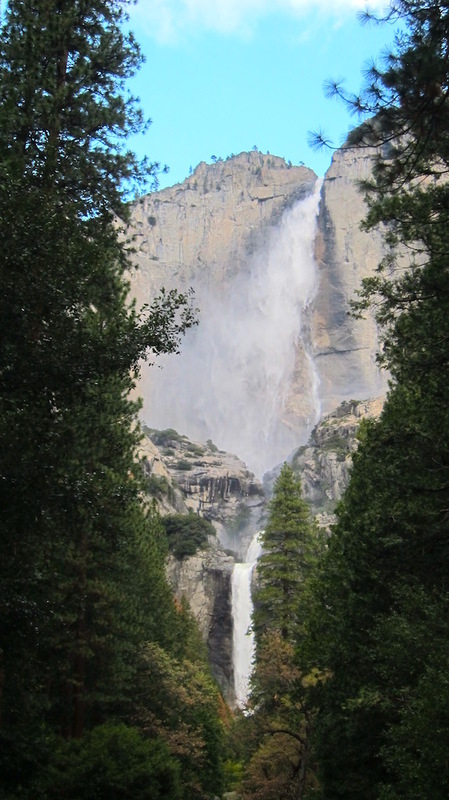 A month ago I was days away from activating Yosemite National Park soon to be followed by Death Valley and Joshua Tree. The ARRL set up an official NPOTA Facebook group and it’s an online version of the Cheers bar but without a closing time. Stop by and you’ll discover spotting announcements the moment someone gets on the air at a NPOTA site. Plans for future activations are announced. And just like you’d find at any bar, you’ll have one or two unloading a small heap of their frustration or trouble that happened hours before. The Facebook group page has allowed me to connect with more than one new operator and I think I’ve made quite a few new friends for life. I’m thankful to the ARRL for creating the NPOTA event and all the things connected to it. NPOTA has become a touchstone for many in amateur radio and I predict it will be long remembered as we float down the river of time. If you’re one of those dormant operators like Laura, I urge you to get on the air now. Experience the thrill of controlled chaos while in a pileup. Be brave and do an activation. Get outdoors and experience the unparalleled beauty of our great national parks and historic sites while snagging signals out of the ether. Two weeks ago I was in southern California. I was starting day eight of a ten-day vacation with my youngest daughter Kelly. 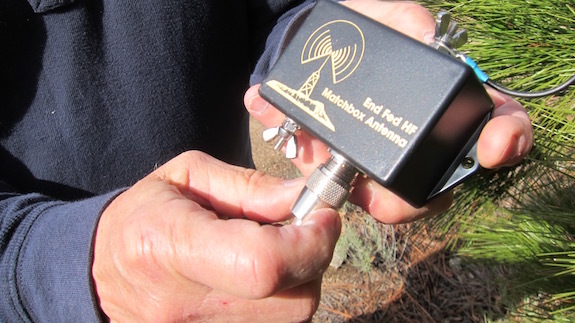 We were going to see as much of Joshua Tree National Park as possible and I was going to try to activate it as part of the National Parks on the Air year-long celebration the American Radio Relay League was sponsoring in conjunction with the National Park System. 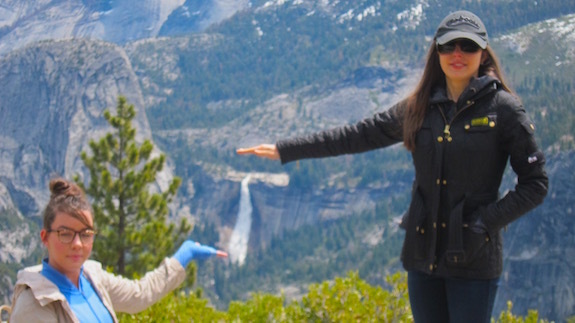 Just days before I had activated Yosemite National Park and Death Valley National Park. 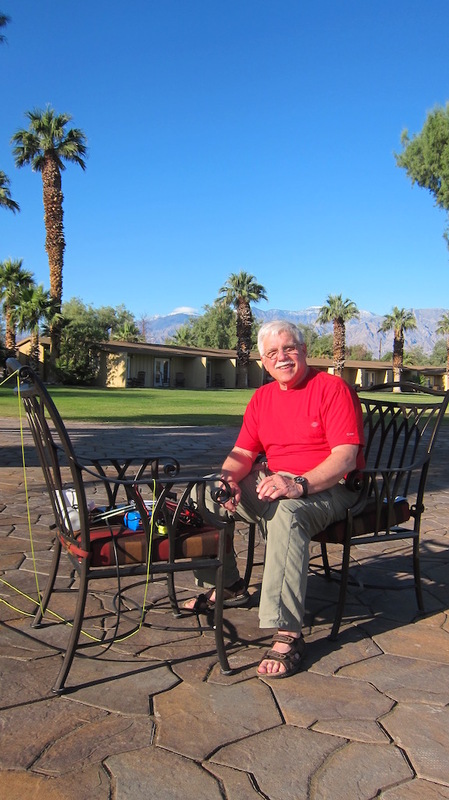 Basking in the success of those two activations, I was excited about the possibility to set up my Elecraft KX3 and my 29-foot wire antenna that connected to a 9:1 unun somewhere in Joshua Tree. I need a tree to put up my stealth antenna. I’m used to tall trees where I live in New Hampshire. Many are over 100 feet tall. 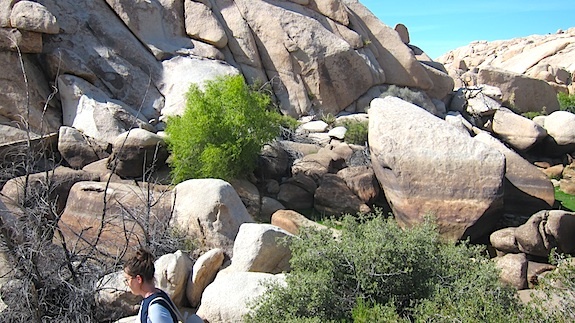 The trees at Joshua Tree National Park are more like saplings. Most are maybe 15-feet tall at the most. But first and foremost it was more important to me to make sure Kelly got to see everything she wanted to see. This national park was to be the highlight of the entire trip, so I was determined that radio would take a backseat and if I didn’t get the chance to operate, well, there’d be another day perhaps. This might be the last time ever I’d have a chance to be here with Kelly, and there are always radio waves in the ether to capture. It was an easy decision to make. 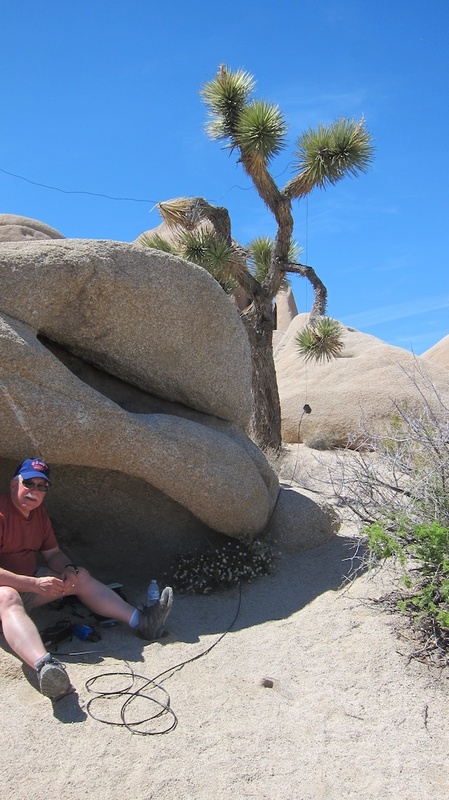 We were staying at a rental home just two miles from the west entrance into Joshua Tree. I’ve been to many national parks out west in my life and I have to tell you it was the oddest national park to enter I’ve ever seen. 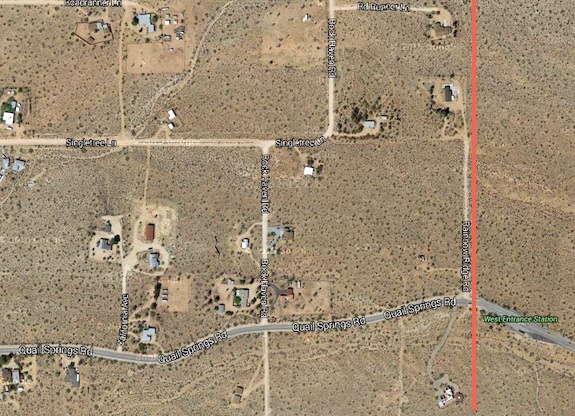 As you drive up Park Boulevard from the visitor center in downtown Joshua Tree, CA to get to the entrance gate the road changes its name to Quail Springs Road. It’s just a normal residential street with all sorts of houses and driveways feeding off the main road. Then all of a sudden you’re at the park gate. There were normal residential houses within a stone’s throw of the park boundary. Crazy but true! It was to be a perfect day. 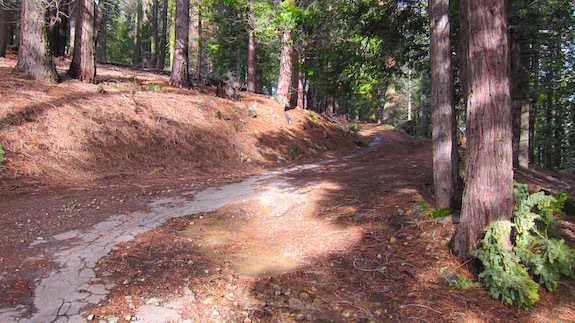 The weather was to be sunny with a temperature ranging from 70 to 90 F. The temperature difference happens because parts of the park are much higher in elevation than others. The higher you go, the cooler it gets. A waitress at a local restaurant told us we were here at a good time. In just a month it starts to get uncomfortably hot. She said, “It can be 90F at 6 am and can easily get to 115 F or higher in the park by midday.” That’s deadly heat in my opinion. After touring the park for about four hours, Kelly and I found a great place to eat lunch in the center of the park on some picnic tables. There was no shade, but we survived. She decided to find some shade in a jumble of tall rocks and suggested I try to get on the air. 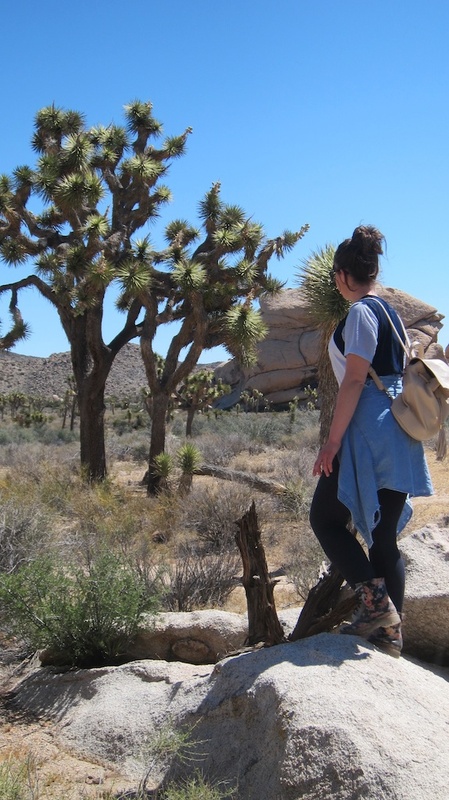 The biggest problem at Joshua Tree national park is the trees. As I said before, they’re all about 16 feet tall or less. I need tall trees to get my antenna up in the air. There were no decent trees where we were eating lunch so I tried to use a telescoping fiberglass fishing pole I brought to create a sloping antenna. I set it up in a crack in a rock that had a slight overhang creating a small spot of shade. It was a complete and utter FAILURE. My antenna had to be the most wretched one ever deployed by a radio operator. I couldn’t hear one signal and tried, with no success whatsoever, sending CQ to get one QSO. Nothing happened except me generating a considerable amount of frustration that I hid from Kelly. I packed up and we continued to see all the sites we could. The best scenery in the entire park was at Barker Dam. Kelly and I both agreed on that. It’s a medium-sized canyon that has a natural narrow spot in the bedrock that allowed an early cattleman back around 1900 to build a small dam. It was close to 5:30 pm when we finally got back to our rental home. We were both tired. “Dad, why don’t you go back up into the park and try to do your radio thing again?” Kelly knew I wanted to activate the park. I was tired, dusty and my stomach was starting to remind me that the peanut butter sandwich hours ago was a meager offering to the waistline god. When we had gotten in the door to the rental, Kelly had asked for my camera to see the photos I had taken during the day. It was on the dining room table where she left it. In my haste to leave, because I knew I’d eat up at least an hour, I burst through the door without my camera. To add insult to injury, my cell phone battery had been sucked almost dry of power because I had failed to turn it off while in the park. I could see the red danger level in the battery and plugged it into my car charger for the short trip up the road to try to get some electrons back to where they belong in the battery. Soon I was to regret not having a camera. The excitement started to build as I drove to the park entrance. Would I be able to find a tree near the road that might work for an antenna? I had to drive about two miles or so up into the park before I located a small turnoff on the north side of the road that had a somewhat decent tree that might work. The tree was maybe 15 feet tall. It was child’s play getting my halyard line up and over a branch. I knew the best thing to do was to slope it to the east to have any chance of getting out with my meager 10 watts. 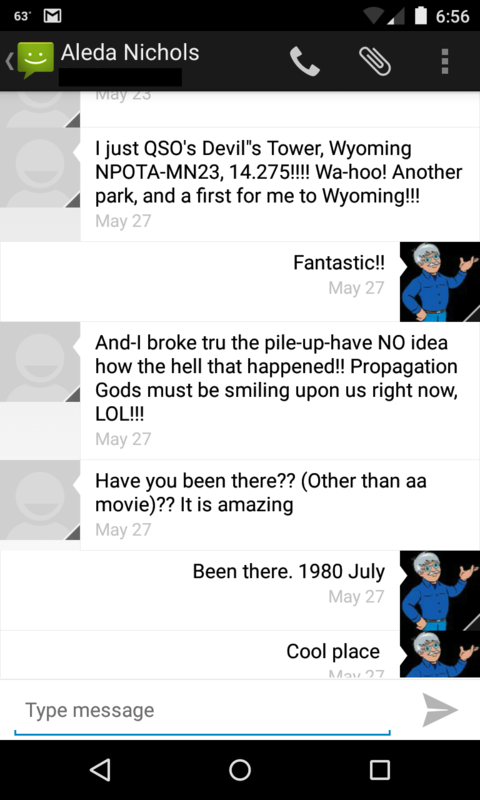 I was just about ready to go and fortunately I had one bar of cell service and texted my CW mentor Jim Cluett, W1PID, in NH. I told him I’d be on 14.060 in about a minute. The last thing I had to plug in was my micro Pico paddles. I did that and in the rush I touched the ‘dah’ paddle generating a tone. INSTANTLY Jim came back with his call sign. It was so strong it was if he was next to me with his volume up as high as possible. I was stunned. Magic may happen. I made 14 QSOs in about 45 minutes with several to New Jersey and one down in Puerto Rico! All the while I was constantly checking for scorpions and rattlesnakes as I was sitting on the sand right in the middle of scrub, cactus and the setting sun. I decided to take a photo of my setup. Once again I had made a mistake. While on the air, I had left my phone on and it was now completely dead. There was to be no photo of this activation. However, I was beaming with happiness having activated each of the three national parks. I packed up my gear as fast as possible and got back to the house for a fast shower and some dinner. Later that night I transferred my hand-written log notes to my tablet where I have HamLog running. My biggest regret was not being able to get a photograph of the horrible antenna setup. My biggest takeaway was a sloper antenna, just 14 or so feet off the ground is plenty to pull the elixir out of the ether. 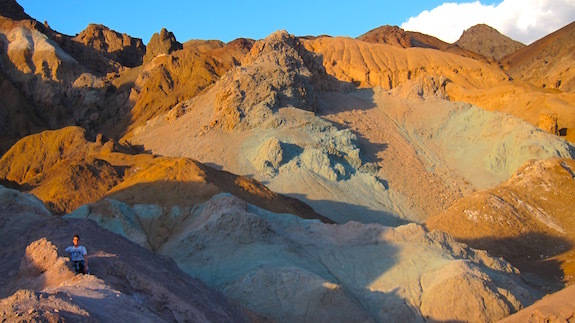 Your vision of Death Valley National Park might be like the one I had if you’ve never visited it before. I equated the name to a place so harsh nothing lives there, not a bush, tree nor creature of importance. 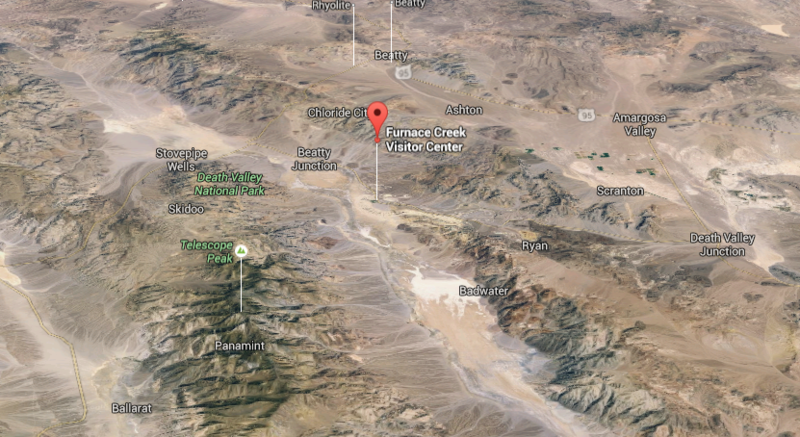 Believe it or not, there’s a natural oasis, probably more than one, within Death Valley National Park and I happened to be staying there for two nights. 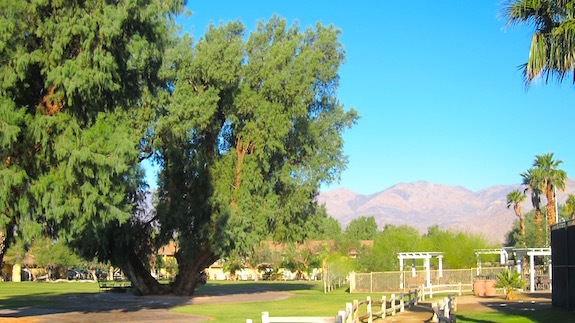 It’s the The Ranch at Furnace Creek. I was there with my youngest daughter. 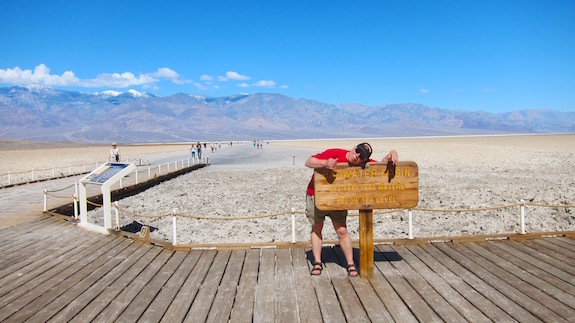 We were on a whirlwind six-day trip through three of California’s national parks – Yosemite, Death Valley and Joshua Tree. This vacation was special for me for a number of reasons. First and foremost I was going to be spending time with my two daughters. 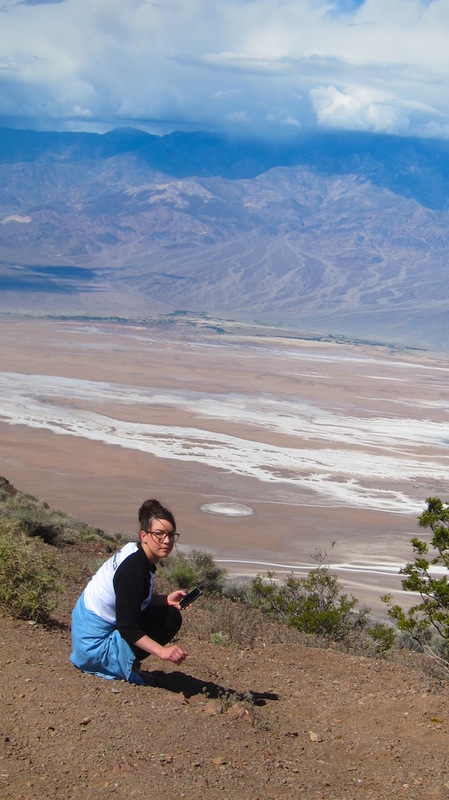 Second, I had never before been to Death Valley nor Joshua Tree National Parks. Both somehow escaped my attention on my many past forays out west over the past forty-five years. Within thirty minutes of arriving within the boundary of Death Valley, I knew that it was going to be jaw-dropping beautiful. 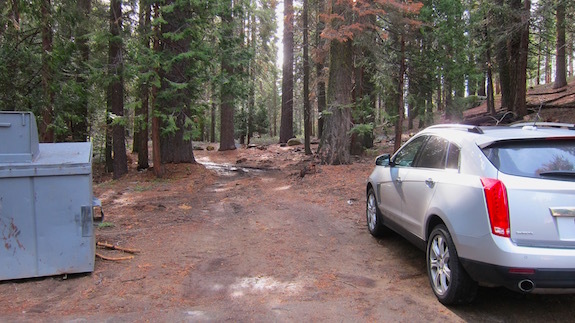 We were nearing the end of a punishing 9-hour drive from Yosemite National Park. The drive would have been just a little over four hours had the Tioga Pass road at the north end of Yosemite been clear of snow. My college degree is in geology and there’s more geologic eye candy here than any place I’ve ever seen. The variety of rocks and the range of their colors took my breath away. Before we left New Hampshire on this ten-day vacation, my daughter agreed that she’d have no problem me playing radio for several hours at each park. Just a little over 48 hours before I had successfully activated Yosemite National Park. I was anxious to try to activate the three parks we’d be visiting as part of the year-long NPOTA event. Once we checked into our two-unit spartan room at The Ranch at Furnace Creek, Kelly and I took a walk through the compound. Just 600 feet to the west of our room was the swimming pool, golf course and a very large lawn area that was available to a motel-like structure where more guests put their heads on pillows. I was astonished to see two massive salt-water cedar trees in a large patio area next to the lawn. 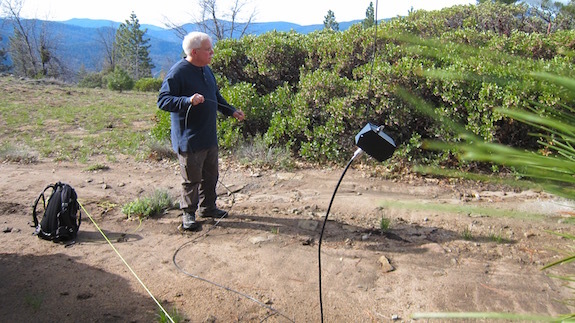 Each had to be at least 40-feet tall – more than enough to string up my thin wire antenna. The next day I set up once early in the morning before Kelly and Ieft to explore the park. I got skunked. The band simply wasn’t open. Later in the afternoon, I came back around 3:45 PT and set up right under the one giant salt-water cedar tree. Magic was about to happen. I went to 20 meters, texted my outdoor radio mentor Jim Cluett, W1PID that I was on 14.060 and he spotted me. 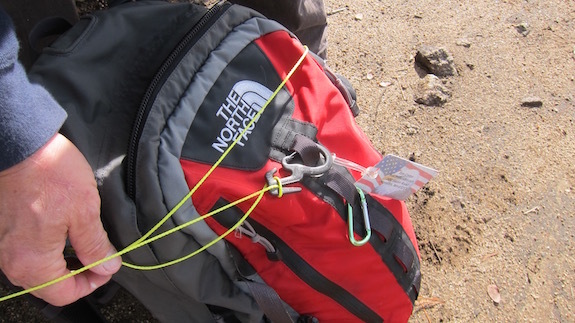 Spotting is everything if you want a successful activation as part of the NPOTA. I’ve got a few other tips below. 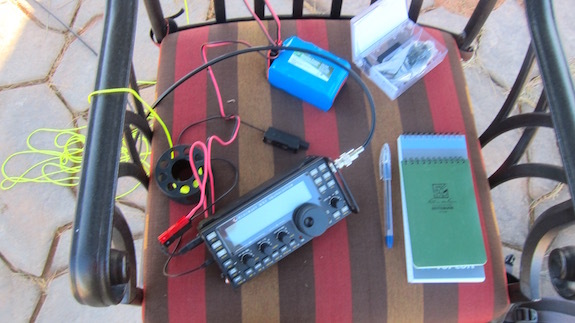 Once I was spotted, my Elecraft KX3 was put to work. 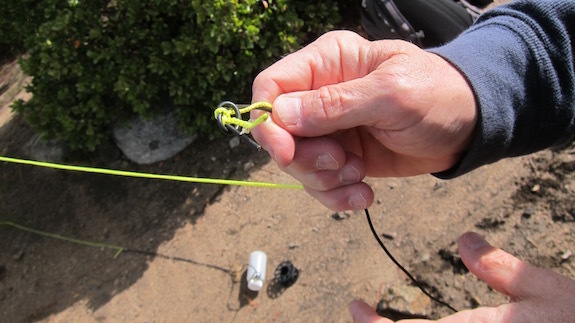 I had it attached to a 29-foot wire that hung vertically from the massive salt-water cedar tree. The end of the wire was connected to a 9:1 unun and a 25-foot coax cable snaked across the ground to my radio. My understanding of the connections within the unun lead me to believe the coax cable acts as a counterpoise in this configuration. Once I put the micro Pico paddles down after my last QSO, I was elated. Never before had I done that many QSOs in such a short time outdoors. It was a balmy afternoon and I realized I had reached yet another new level in my amateur radio journey. If you plan to do an activation at Death Valley, I highly recommend working under the giant trees I used. The area is fairly private and the tourists shouldn’t bother you. Don’t think about putting up a tripod antenna setup. Just put up a simple wire antenna as I did. It’s stealthy and it works. You’ve got cell phone service at The Ranch so you can have a friend back in civilization spot you. Take advantage of that. Forget about activating this place between June 1 – September 30, 2016 unless you bring some eggs you want to fry on the stamped concrete next to where you’re operating. On Friday morning, April 29, 2016 I had the distinct pleasure to be high on a ridge just a hundred feet inside the southwest border of Yosemite National Park. I was there with my Elecraft KX3 ready to communicate with at least ten other radio operators. 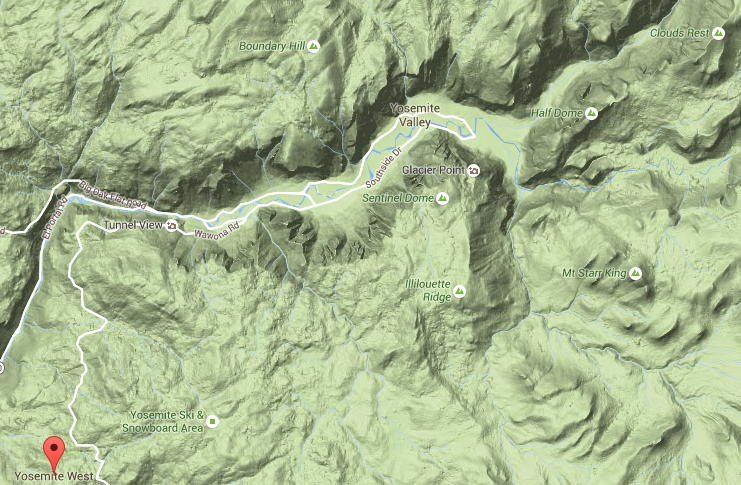 If this happened, I’d successfully *activate* Yosemite National Park. I was in Yosemite on vacation with my two daughters and my son-in-law Brent Walter. Yosemite was the first of three national parks I’d see with my youngest daughter over the next five days. 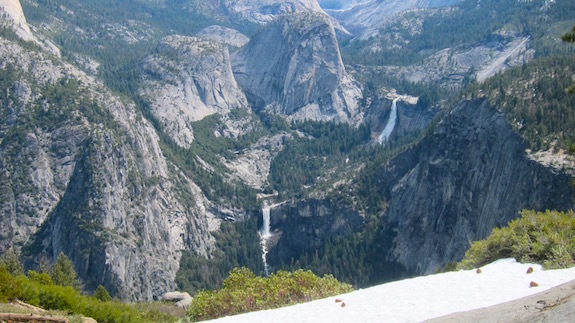 Once we finished at Yosemite, we were off to Death Valley and Joshua Tree National Parks. It was my goal to set up my radio in all three parks as part of the year-long National Parks On The Air (NPOTA) event that’s celebrating the 100th anniversary of the National Park System. Yosemite West is an interesting location. 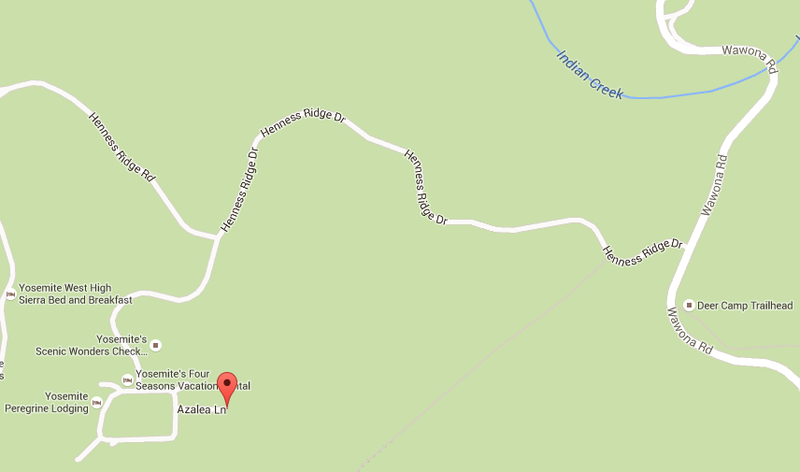 It’s a private single-family housing development that abuts the national park. 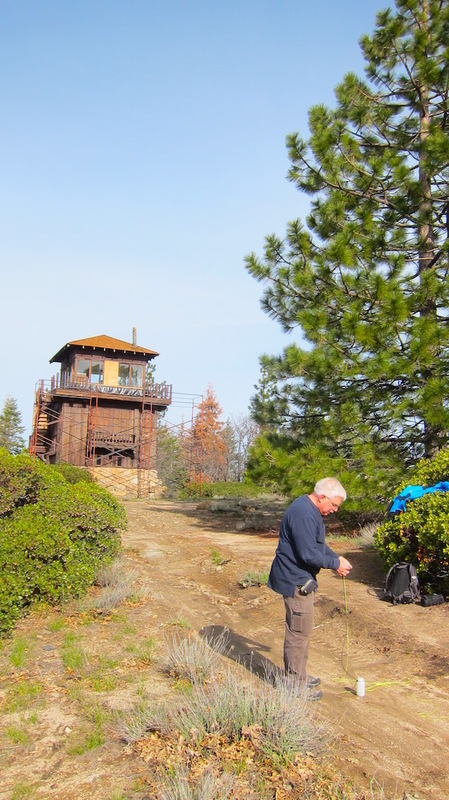 At the end of one of the small dead-end streets, Azalea Lane, there’s a dirt road that leads up to a park fire-watch tower and cellular phone tower. The owner of the house I was staying in revealed this perfect operating location to me the day we arrived. Without his guidance, I would have never known about this ideal operating location. 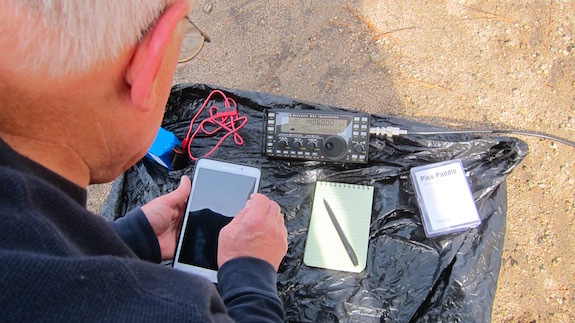 Previous amateur radio operators had tried to activate Yosemite setting up down in the steep-walled granite valley and had very limited success. I knew I needed to be up and away from the valley walls for my meager 10 watts of power to get the attention of other operators. It worked, just barely. The following photos and video should do a better job of communicating where I was and what I was doing that gorgeous sunny morning in the crisp mountain air. Jim Massara, N2EST, is a talented artist. I’ve never met him in person, but hope to one day. 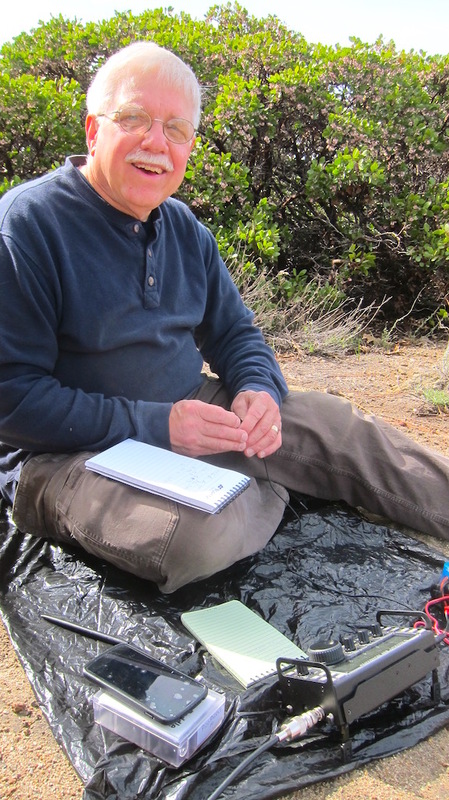 I’ve created this post because if you’re an amateur radio operator who loves the QSL card aspect of our hobby, then you need to know about Jim. Just a little under three weeks ago I became aware of his work. 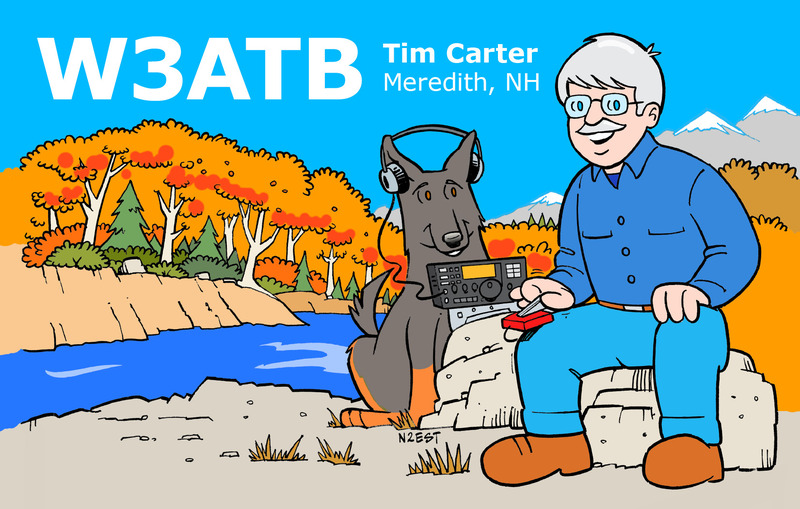 Jim creates unique one-of-a-kind QSL cards using cartoon art. He extracts from you what your passion is about the hobby, your favorite colors, etc. and uses that to create a vibrant card that screams to the recipient who you are. Here’s the crazy thing. When you do the math, it costs less than a penny per card extra for Jim to create a unique one-of-a-kind QSL card that undeniably gets the attention of any operator you send it to. My guess is that many of the cards that Jim has created adorn the walls of radio shacks all over the world while standard beige manila cards languish inside dark drawers or shoe boxes or end up in trash cans. Let’s do the math. At the time I wrote this post, Jim charges a one-time fee of $200 for a color cartoon of you. If you order 1,000 QSL cards that means you’re paying just two TENTHS of a penny extra for your one-of-a-kind card. Don’t you feel it’s worth that to get a stunning QSL card when you don’t seem to hesitate to spend $1,000 or more on a radio, antenna, or who-knows-what? CLICK HERE now to get your own special card from Jim. Once again, I’ve got no pecuniary interest in Jim or his business. Be sure to contact me after you get your card from Jim. I’d love to see what he did for you!